Though the competition between the three actors is likely to remain, they can also move forward with collaboration in four specific areas. Over the past decade, Southeast Asia’s economic and geopolitical profile in the world has risen dramatically. As the three largest economies in the Asia-Pacific with the most substantial global interests, the United States, Japan, and China are naturally the three most important and active outside powers in Southeast Asia. At a macro level, all three countries have broadly shared interests in Southeast Asia, as a prosperous, stable, and connected Association of Southeast Asian Nations, or ASEAN, is good for the economic vitality of the entire Asia-Pacific region, including for China, Japan, and the United States. Unfortunately, despite these shared interests, competition between Japan and China and between the United States and China has come to dominate these countries’ national approaches to the region. And while each country is more deeply involved in regional affairs than ever before, there is exceptionally little dialogue between and among the three countries regarding their policies and activities in Southeast Asia. This dynamic is unfortunate for all parties, most importantly for Southeast Asian partners, as there are almost certainly opportunities for collaboration that are being missed. To begin to bridge this gap, the Center for American Progress, or CAP, convened a trilateral dialogue of Southeast Asia experts in Tokyo in December 2016. This dialogue surfaced four areas for potential trilateral collaboration with Southeast Asian partners, which are more expansively described in a recently released CAP report. Though advancing cooperation among these three actors has its share of obstacles, these four areas are a good place to start. In recent years, China, Japan, and the United States have each launched ambitious regional cooperation plans with the countries of the Lower Mekong Subregion. With the United States, Japan, and China all interested in stability, prosperity, and connectivity in the Lower Mekong Subregion, the three countries should engage in a serious effort to coordinate policy and activities. Since Myanmar’s dramatic period of reform began in 2011, the international community has rushed in with assistance and investment, making the country a hub for international activity, including by the United States, China, and Japan. While Myanmar is in desperate need of international involvement, the last thing it needs is to have to manage international rivalries. Unfortunately, suspicions run rampant between China and Japan regarding their respective activities in the country, and China has deep suspicions about U.S. intentions. With all three countries invested in Myanmar’s success and the country’s needs so great, trilateral coordination on peace and development should be enhanced to maximize assistance and investment and to tamp down mutual suspicions. Southeast Asia will require trillions of dollars of infrastructure investment to achieve its economic potential in the coming decades. To even begin to close this gap, foreign investment from outside powers, such as China, Japan, and the United States, will be essential. And all three are already actively involved: China through bilateral agreements and its development banks; Japan bilaterally and through the Asian Development Bank; and the United States through private industry and the World Bank. However, these efforts are not currently coordinated in any meaningful way. Greater synergy in national efforts to boost physical connectivity should be a top priority for policy coordination. Electrical grid infrastructure, energy production, and standards harmonization could be particularly fruitful areas for collaboration. With the health of the region’s waters critical to food security and livelihoods in Southeast Asia and for the world, the United States, Japan, and China each have a stake in active, science-based environmental stewardship in the waters of Maritime Southeast Asia. With no reason for environmental protection issues to be competitive so long as activities did not confer any form of territorial rights, cooperation in this area would be another prime opportunity for the three parties to coordinate policy. Because diverse national interests converge on a variety of issues—including the sustainable management of ocean resources, multilateral cooperation on scientific research, health and management of fisheries, coastal ecosystem restoration and enhanced climate resilience, solid waste management to reduce marine plastic pollution, and implementation of green port infrastructure—all would be productive and mutually rewarding areas for cooperation. The United States and China have already engaged in bilateral cooperation efforts on some of these issues, including the U.S.-China Green Ports and Vessels Initiative. The clearly competitive elements of Chinese, Japanese, and U.S. engagement in Southeast Asia mean that a major shift in thinking will be necessary for policy coordination or cooperation to occur. However, with the needs in the region so large and ASEAN’s success so clearly in each country’s national interest, greater dialogue on these issues would be a positive development. 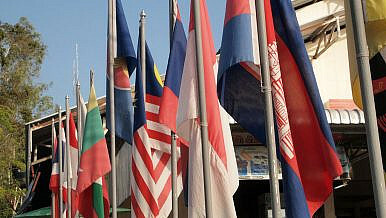 With many Southeast Asian countries concerned about animosity between the outside powers and afraid of being caught in the middle of heightened competition, it would also benefit all three parties’ relations in Southeast Asia to broach the idea of cooperation or at least policy coordination on nonstrategic matters where interests align. While the onus ultimately lies on the countries of Southeast Asia to guide the outside powers to the areas of potential convergence, it is clear that more dialogue—both trilaterally and with Southeast Asian countries—has the potential to produce unexpectedly useful outcomes.